We found ourselves with an appointment in Giesing Tuesday night, so I leapt at the opportunity to do a little research on where we could grab a bite to eat. Giesing is one of the few still barely affordable and ‘up and coming’ neighborhoods in the M.U.C.. I’m ashamed to say I know woefully little about it. 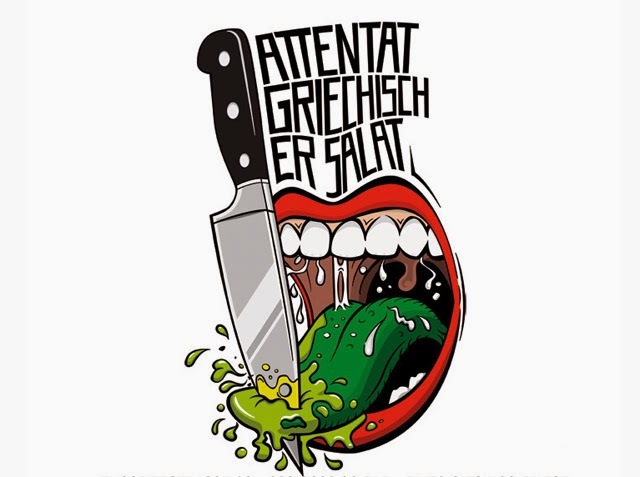 So I was glad when Google maps pointed me to Attentat Greichischer Salat. It was, as the pix in a Google image search suggested, a funky, lively bar restaurant frequented by a youngish crowd serving hipster (and I mean that in a good way) food. Basically, if you’ve ever had a salad at Nauge und Sauge or Cooperativa, it’s the same idea (I wonder if the restaurant was started by ex-staff?) A big ‘salad’ topped with sauteed meat and vegetables. This meal is always a winner with me. I had the ‘Dennis’ something or other salad (they all have clever names) which is a bunch of potatoes and sausage on a mountain of mixed greens, but it is listed as a salad on the menu, so I feel great about my healthy meal choice. The good vibe, decent prices and friendly staff definitely make Attentat Greichischer Salat one of the new ‘pins’ on my yet to be explored Giesing map.